World GP Bike Legends are delighted to announce they will be riding in to the Estoril Classic on 6th and 7th October 2018, continuing their journey round the globe. Our first visit to the Estoril Classic will see our Legends riders and bikes wow a whole new audience with the speed, sound and daring that the World GP Bike Legends are renowned for. The World GP Bike Legends will be on track on both Saturday 6th October and Sunday 7th October 2018, riding some of the most exceptional motorcycles the world has ever seen: the brutal 500cc two stroke bikes from the best loved era of motorcycle Grand Prix. With a chance to see some of the rarest and best loved bikes of all time alongside some of the most incredible new machinery available today, the event is not to be missed. 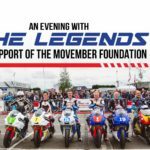 With appearances from Legends Phil Read, Freddie Spencer, Wayne Gardner, Carlos Lavado, Steve Baker & Raymond Roche fans are in for the ride of their life: with 15 world titles between them, these men of steel want to ride and to win. These World Champions are joined by Pierfrancesco Chili, Niall MacKenzie, Niggi Schmassmann, Jurgen van den Goorbergh, Jose Cardoso and Luis Jose Maurel representing the worldwide talent from the glory days of racing. Also live on track and on home turf will be Alexandre Laranjeira, Nuno Andre and Hermano Sobral who will all be sure to want to fly the flag for their home fans. Who will get the bragging rights in the wrestle for power under the Portuguese sun? With the Race of Legends and Classic Parades to enjoy, fans can also Meet the Legends over the course of race weekend. A rare opportunity to meet some of the bravest and dedicated men ever to grace the world of motorsport. The Estoril Classic has rightfully secured its place in the festival calendar, with over 20,000 visitors to the Estoril Circuit in 2017 alone. The Estoril Classics week takes place from 2nd- 7th October and includes the F1 Classic, Historic Endurance, CCS Group 1 and the Historic Portuguese rally. To find out more please visit www.worldgpbikelegends.com or follow us on Facebook, Instagram and Twitter.